I think the room really is spinning after reading that. Thank goodness they found it--and at eight lbs, how do you not? I'm glad you updated--I've been major blog stalking. Hope you feel better! WOW! Will said you had a cyst, not a huge 8 lb "bowling ball"! I agree with Harmony (not that we even know each other, but...)HOLY CRAP! My jaw dropped -literally -after reading that. Wow. I'm glad you're ok though (well, aside from the puking and ran-over-by-a-truckedness. Hmmm... I think I just made up a new word. Good luck. We're all praying for you! I've been praying for you all week...I never dreamed of a complication like this! How'd they find it? Wishing you rest, good news and smooth surgery. OH. MY. GOSH. Brandi, that is just plain nuts. I hope the narcotics make the pain tolerable and that you can have at least a few days of food before surgery #2! That's insane! How did it get so big? I had teeny ones and passed out on the bathroom floor. Cysts don't like me though. Well, good luck on waiting to hear about the cyst and, as I know the results will be positive, good luck on the (next) surgery! Ditto on the HOLY CRAP! What on earth?! You really should make a list of all ailments you've had. Why you? I'd ask what else could go wrong, but I'm afraid to. Love you! Hope you feel better soon. ZOMG! I believe that posts like this were what the text "ZOMG!" were made for. 8lbs! What kind of WTF-ery is that?! Okay, I'm done being shocked...I'm not but I'll move on. Hope everything turns out okay. Yay for real food! And I hope this all gets taken care of promptly. I just have to echo the HOLY CRAP. OK, you TOTALLY deserve a chocolate sundae to deal with this. And heck, even if you gain a pound from it, you'll still have a net loss of 7 lbs! 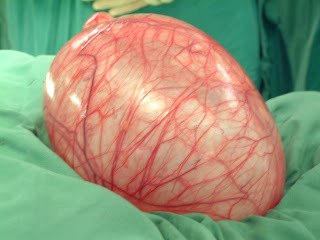 Oh well, at least it was an ovarian cyst and not some freaky thing like a second head or something. Yeah I'm with Lydia at least it was a cyst and not another Head. Laughing so hard at the comment. Ditto to the Holy Crap!!! Glad you can eat... I too will pray harder... Counting down until next Wen. I just dropped by to see how the surgery went. Oh My Heck!!! (sorry about the UTAH slang) wow!!! I am amazed! what a shock! You should get royalities from the medical textbook they are going to write about you. Oh well, Hurray for food. Chow down on everything you have been craving. After that You deserve it. I hope everything works out OK so that it's a green light for next Wednesday. My thoughts & prayers are with you! Ditto on Crystal's WTF-ery. I think I'm going to use that. Didn't you have pain from that huge cyst? Eventually, Brandi, eventually, you'll be able to have your surgery. Best of luck to you. I'll up the ante with a HOLY. FREAKING. CRAP!!!! How in the h-e-double-hockey-stix did they do all of your pre-surgery work-ups and NOT FIND A BOWLING BALL IN YOUR ABDOMEN?!?!?! Unbelievable!!!!! I hear you on the hit-by-a-truckness (apparently the vast majority of your friends and readers like to make up their own words), I feel that way after every c-section. Ask for Dilaudid. Dilaudid is GOOD stuff. Anything you'd like when the post-anesthesia puking subsides? I can run some pizza or chocolate or hmmm... guacamole by the house. (I'm known for my guac and I always make it in very large amounts... :) JLMK! Hey, at least you get food and drugs. It could be worse, you could have to breastfeed that thing!